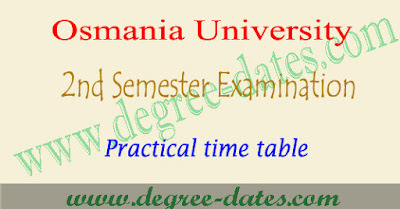 OU degree 1st year 2nd sem practicals time table 2017 : Osmania University official has released osmania university degree 1st year 2nd semester exam schedule dates for the academic year 2016-2017.So candidates can be downloaded OU degree 1st year 2nd sem practicals time table 2017, OU degree 2nd sem time table 2017 from the following article. Here we have to update latest details regarding of OU degree 1st year 2nd semester examination like ou degree 2nd sem fee dates,ou degree 2nd semester time table 2017,ou degree 2nd sem hall tickets , ou degree 1st year 2nd sem results and revaluation fees and application form details. PRACTICAL EXAMINATION SCHEDULE – May 2017.
to conduct the Practical Examination on the basis of Nominal Rolls submitted by the Principal or onthe basis of Hall Ticket of the candidate. to send the Answer Scripts, immediately, but not later than 09.05.2017 along with the ‘D’ forms and the award list in duplicate in the same bundle. All the U.G(CBCS)college Principals are hereby informed that the following details are to be noted for up-loading Semester-II Internal marks of U.G courses offering under CBCS Semester system from the academic year 2016-17. 1. 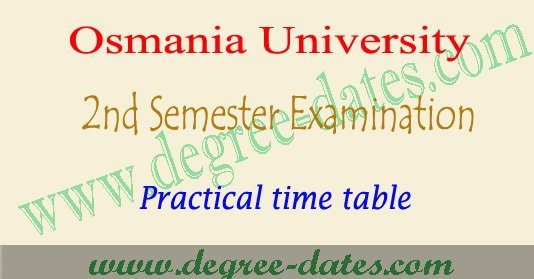 UG Second Semester 2nd Internal assessment will be conducted as per the ou almanac i.e on 12-04-2017& 13-04-2017.Principals are required to upload the marks on ou Website through college logins on or before 21-04-2017at 5.00 p.m .College logins will be closed automatically. 2. There is no re-conduct of internal examination under CBCSsystem. 3. Maximum Internal marks for all UG course subjects are 15 marks(out of 100 marks) excluding 5 marks for assignments. 4. Maximum Internal marks for AECC subject i.e, Gender sensitization are 10 marks for all UG courses (with no assignments). 5. Already 1st internal assessment marks were uploaded for 15 marks. This time you are required to submit the 2nd Internal assessment for 15 marks and assignment for 5 marks. 6. Finally, average of I & II internal marks (15)and assignment marks (5) will be aggregate for 20 marks. 7. Absent should be noted as If Ab". 8. Principal will be held responsible for entries made on the website and award list for Internal assessment. 9. Printed award list along with D- Form should be submitted to exam branch on or before 26-04-2017 . Fine will be imposed after the due date.